I love fresh herbs and spices, and really who doesn’t? I’ve been in the process of making something more than once to find that I don’t have what I need. Once I had sage on hand, but not ground. Uhhh … crap. I of course happen to be a gadget freak, and while that causes issues with cabinet space it comes in handy for random instances such as the above mentioned sage issue. How? While making my BBQ sauce I ran out of black pepper. 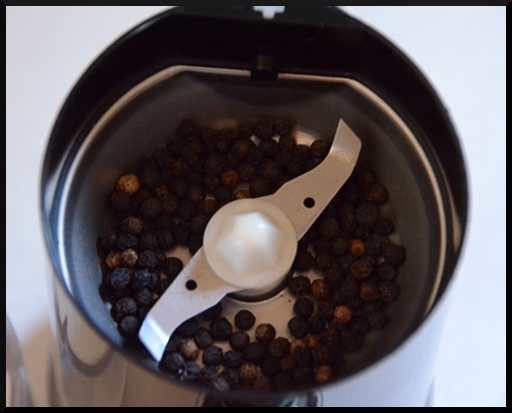 So I got down my coffee grinder, which for the record has not ground coffee in nearly 6 years, and filled it up with peppercorns. 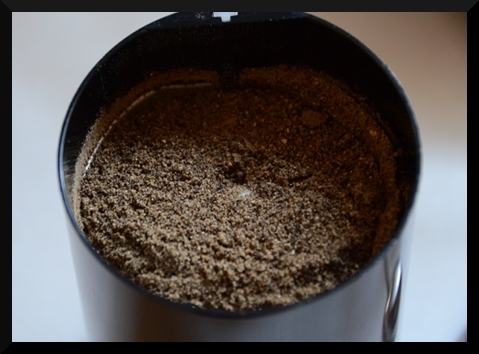 Fill the grinder up until the blades are just covered and go to town until you get the desired coarseness.